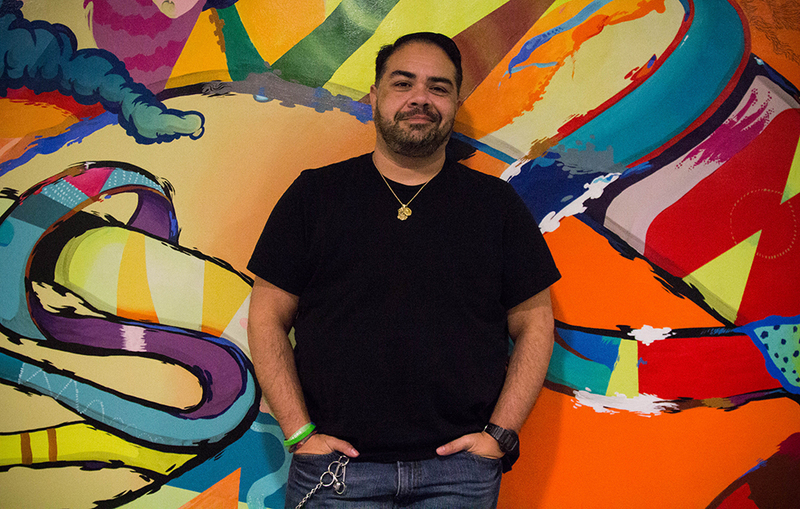 Senior visual and media arts major Chase Ybarra decided to change his path later in life and attend Emerson. Senior visual and media arts major Chase Ybarra, 44, has 20 credits to complete before he can graduate. But when he ran into financial trouble, he questioned whether he would reach the finish line he worked so hard for. Siobhan Dolan, a senior and fellow member of the film fraternity Delta Kappa Alpha, started a fundraising page the first week of November on YouCaring where people can donate money to help Chase pay for his final semester at Emerson. The page has 230 shares and has raised almost $2,500 for Ybarra, who is now registered for classes in the spring. The financial aid office has also given him more scholarship money to cover class registration for the spring semester. This means the fundraised money will go toward credits Ybarra has to take in the spring. “I can now totally and completely focus on school and not worry about the money aspect or if I’m going to be able to graduate,” he said. Ybarra grew up in Stockton, California and in 1990—his junior year of high school—he sat down with his counselor to discuss his options for college. She immediately told him he wasn’t fit for college and should look at vocational options. “I just felt sick, thinking I wasn’t smart enough. I took it at face value,” said Ybarra. He ended up working at call centers and phone companies until 2010. As a trans man, Ybarra said he grew up aware of the female trans population but never of the male trans population. Ybarra’s moment of clarity came in his 30s when he reconnected with an old friend who had come out as a trans man. The friend became Ybarra’s mentor when he began the transitioning process in 2006. Ybarra’s life took another turn in 2009 when his sister-in-law called to tell him that his nephew, committed suicide. The nephew often lived with Ybarra because the young boy’s father was not usually around. Ybarra said the loss felt like losing a son. He jumped at the opportunity to move away from California to Boston in 2010, where he worked at another call center. At the end of his two-year contract, Ybarra took a step back to reevaluate his path in life. He decided to give school another shot and in 2013 enrolled at Bunker Hill Community College in Charlestown. After two years pursuing an associate’s degree, he graduated with honors in 2015 and was awarded the Next Step Scholarship to Emerson. Movie making and production has fascinated Ybarra since he was 9. His passion was fueled by movies like Raiders of the Lost Ark and the original Star Wars trilogy, but it was The Color Purple that made him fall in love with cinematography and post-production. Ybarra enrolled at Emerson in the fall of 2015, with a major in visual and media arts. He soon found a place on campus when he joined DKA. Meghan Corless, Ybarra’s “big sister” in DKA, said his kindness and experience has helped many students since he’s been at Emerson. When looking back on his life, a simple metaphor comes to Ybarra’s mind.